In 2016, an A/E/C stakeholder group shared with members of the masonry industry that due to building codes, energy codes and other requirements, masonry and its components had become more challenging to design. The Masonry Institute of Washington (MIW) and its industry partners, set out to create a document to make masonry products easier for architects, engineers and general contractors to design and construct. These stakeholders recognized that architects, GCs and engineers have different resource needs when it comes to designing or constructing with masonry. Due to GC, CM and design-build construction representing more than 50% of the construction methods, they wanted it to be easier to construct. In sum, providing one-stop information for the entire high performance masonry wall system. The Masonry Systems Guide, Northwest Edition, allows the mason contractor community, through the Washington State Conference of Mason Contractors’ Contractor Certification program to have a new marketing tool that sets them apart from all other mason contractors, in that they received education and resources that allow them to bid the entire masonry system from the sheathing out simplifying the process and the number of subs for the GC. This program is entirely voluntary. One primary focus of discussion was the message could not stop at the written word. The Masonry Systems Guide, Northwest Edition, was the beginning. Sponsorship money was focused on providing costs of presentations and training workshops for both the industry and A/E/C end users as well as for the development of an identity package branding the industry completed the 2016 effort. Branding the industry will have a positive impact on how the Masonry Institute of Washington is perceived. A new logo reflecting the vertical building was created. A slogan honed in on the goal. The color scheme reflects masonry products, natural and pigmented. A new attitude about masonry was developed with the end user at the forefront. To excite designers, engineers, general contractors, construction managers and owners looking for the best value for the envelope. Getting their attention. This Guide was a major part of that initiative. How the Masonry Institute of Washington is perceived by the design and construction community is vital. Proactively educating industry decision makers helps them to most effectively design and construct with masonry, taking advantage of its high level of performance, its flexible and creative beauty and its efficiency in scheduling and budgeting. Masonry is emerging as a preferred building enclosure wall system in the marketplace, due to its versatility and fresh design approaches for the 21st century. Savings are gleaned in a number of areas due to its innate durability, low maintenance and recognized fire ratings. Put simply, masonry does not burn. Similarly, large savings are gleaned over the life of every masonry building due to energy performance with its inherent thermal mass and insulated wall capacity and its noise isolation qualities at no additional cost. Money can be saved on every masonry job – value added. The more that masonry wall systems are designed into a project, architects, engineers and general contractors will have the opportunity to explore their design and construction options. 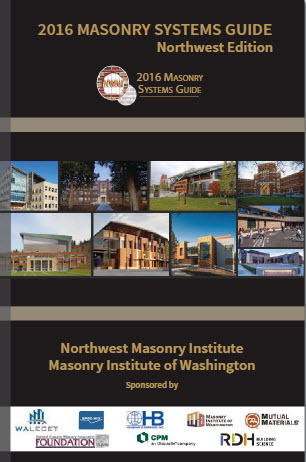 The Masonry Systems Guide, Northwest Edition is a direct path to simplifying and meeting design and construction goals. This Guide is an expansive online and print technical resource of masonry systems providing a standardized technical guideline of best practices for selecting, designing and constructing eight above-grade masonry wall enclosure systems. 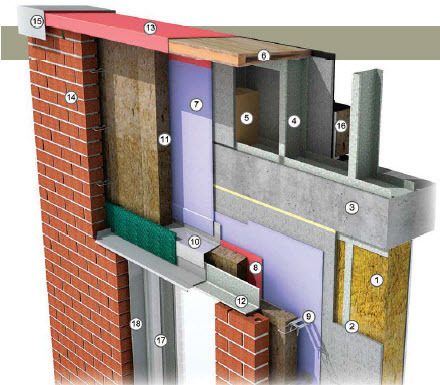 Guidelines focus on various masonry systems – CMU, wood or steel frame backup walls with exposed CMU or adhered or anchored masonry veneer – for their design, specification and initial construction. Also included are cost and budget information, assembly thermal performance values, guidance for air, water and vapor control layers and sample project specifications. The purpose is to assist quality assurance observers and owners who may have limited knowledge and experience in the specifics of masonry system component installation or evaluation. This Guide also serves as a procedural reference for experienced professionals who review masonry systems regularly. It establishes a uniformity of product selection and detailing, demonstrating masonry’s ability to meet current high-performance market demands and to meet current building and energy code requirements. Separate pricing analysis is given. This region specific analysis shows a wide range based on various economic climates, wages and construction preferences such as whether galvanized or stainless steel ties are typical. Pricing includes all components outboard of the structure and provides no evaluation for interior finishes or structure and demonstrates relative price / sf, based on a 10,000 sf wall area with easy accessibility. Expected to be published in March 2017, subsequent version of the Guide will narrow the range with more specifics. The focus for each assembly is to clarify the overall above-grade wall building enclosure design as it relates to managing heat, air, and moisture (both liquid water and vapor) transfer between the interior environment and exterior environment and to demonstrate construct-ability of these structures to ensure long-term durability. Cladding considerations including attachment and installation methods are also addressed, particularly specific to the Northwest region. The online version provides downloadable details (2D and 3D), specification and baseline information to provide assistance regarding the design, engineering and construction of components of masonry building enclosure systems, including exterior walls, accessories, waterproofing, openings and transition flashings. With full representation from brick and block manufacturers, mason contractors and accessory suppliers, the Northwest masonry industry pursued grant funding and sponsorships to move forward with a print publication and website that would include the full masonry system, from the sheathing out, except CMU structural or backup wall. It is an expansion on the 1986 NW Masonry Guide, which, though out of circulation, was still being referenced by architects. This Guide should be considered as a supplement to other masonry industry publications as they describe many details, alternate construction methods and applications. Where project specifications may be inadequate, details are subject to interpretation by professional building enclosure consultants or to the judgment and experience of a commercial mason contractor. The Masonry Systems Guide, Northwest Edition, was created under oversight of professional building enclosure consultants, engineers, architects, experienced commercial mason contractors and other masonry specialists with decades of in-field masonry experience who understand market demands for whole masonry wall system information. These stakeholders were invited to participate with one caveat: completion by November 2015. Holding firm to this deadline required making this project a priority. Two grants were secured early summer 2015 that allowed retention of a consultant moving forward. Washington Laborers Employers Council for Education and Training and the National Concrete Masonry Association Education and Research Foundation grants required benchmarks of meeting deadlines and marketing A/E/C industry education opportunities. Having agreed upon a sports analogy as baseline for accomplishments, a Build it and they will come program was established to recruit sponsors. Everyone was called upon and invited to participate in flexible sponsorship levels and editing opportunities. A product was promised in November 2015. By August, building enclosure consultant RDH Building Science (RDH) was on board, having responded with the most thoughtful proposal and within budget. Forty industry representatives and RDH spent eight hours discussing editing a first draft and agreeing on direction of future drafts. RDH went to work pushing the envelope of both vision and research. By October, the third draft was distributed for industry consideration. All MIW contributors as well as Washington-based suppliers and BAC Local 2 Washington, Idaho and Montana representatives were invited to participate and edit based on their area of expertise and interest. No one was denied input, as long as deadlines were met. National and regional resources in the Guide include those available from National Concrete Masonry Association TEK Notes, Brick Industry Association Technical Notes on Brick Construction, ASTM Standards, TMS 402/602, International Masonry Institute’s Masonry Detailing Series, masonrysystems.org and more. Conference calls resolved snags while RDH worked tirelessly, to develop written and illustrative technical content representative of the industry standard, yet easy to interpret and apply. In January 2016, the full-day symposium in Seattle, Everything Masonry, attracted 170 A/E/C professionals and exhibitors. The website masonrysystemsguide.com was unveiled providing a user tutorial. All eight 1-hour presentations covering information in the Guide were introduced. Resources to Obtain Thermal Numbers Equating to Energy Code Compliance. A Technical Advisory Committee was created to answer questions from the end user. The last regional masonry Guide was published in the Northwest in 1986. 30 years ago. One challenge of this venture was gathering the immense volume of data and reviewing what was outdated, what was useful and what needed tweaks. The Masonry Systems Guide, Northwest Edition, addresses construction budgeting and Northwest-specific requirements that national publications or previous publications had not addressed. Preparing thermal modeling, energy codes and other sustainable data is a new element not included in other publications. Identifying a format and data that was accurate and user-friendly to all end-users was one of the biggest challenges. A cost-comparison chart provides baseline dollar value ranges, allowing for recognition that each project must be considered individually based on the product, accessories and geography of the construction. A resource general contractors and designers could relate to. Building enclosure consultant had resources of both architects and engineers and had many project managers from which to draw. Timing was right for this success story. The next chapter is being written. Naturally there would be required additions, changes, adaptations and further clarifications once the publication hit the market. We are committed to a subsequent edition in 2017 in order to offer the industry as a whole the opportunity to review, come on board and support masonry construction standardization from the sheathing out. Plans are to focus on the Pacific Northwest and increasing the masonry market share in the areas we represent. That said, MIW strongly believes we are one industry with one goal and is happy to help other regions in any way possible. Change, meeting needs of A/E/C clients to assist them with designing high performance masonry with new construction techniques and technologies. Making it easier to use the masonry team of contractors and producers for A/E/C clients – building out from the sheathing. Mason contractors take responsibility for everything that touches or connects to the masonry product, relieving responsibility on the general contractor as well as making our clientele preferred builders. We are working to continue to engage new partners delivering additional technical information and industry input. Feedback from the A/E/C industry has been overwhelmingly positive.